Backpack gnomes are typically found living in backpacks and backpack-dense areas. They are alternately hailed as pests and boons byadventurers. 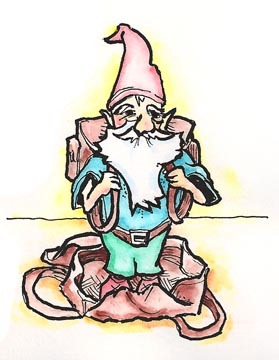 A backpack gnome porter acts similarly to a human porter of level 1-3, but will never flee due to a morale failure. A Backpack Gnome may still otherwise leave a PCs employ normally if they feel they are treated badly. They will typically refuse dangerous duty, unless the duty pertains directly to the carrying of backpacks. Backpack Gnomes will often opt to take their pay in the form of interesting knicknacks and gewgaws purloined from the load carried, possibly without consulting the proper owner. Backpack Gnome characters always gain +1 armor when carrying a backpack, and an additional +1 when inside a backpack. You forgot the +3 to reaction rolls when negotiating Travel & Lodging Expenses. I'm curious as to their relationship with the Locker Gnomes. The relationship between gnomic races is hotly contested, but at the very least there's complex economic interchange between the two. Locker gnomes are, however, much harder to entice along on adventuring expeditions.